In a vast exhibition hall just north of Paris on June 20, about 20,000 people attended an event organized by the largest and best organized Iranian opposition group, the Mujahedeen-e Khalq (or the People's Mujahedeen of Iran). One protest took place on the streets of Iran, where thousands of Iranians fed up with living under a religious tyranny defied Supreme Leader Ali Khamene'i's diktat that they accept the results of the June 12 presidential election, whereby President Mahmoud Ahmadinejad supposedly defeated his main challenger Mir Hossein Mousavi by a lopsided margin. The protestors and Mousavi have both shown bravery but the former seem more radical than the latter. Mousavi's website announces that he does not seek confrontation with the "brothers" in Iran's security forces nor does he wish to challenge the "sacred system" instituted by Ayatollah Khomeini. Rather, the website declares, "We are confronting deviations and lies. We seek to bring reform that returns us to the pure principals of the Islamic Republic." This timidity stands in contrast to the bold stance of the street protestors who shout "Death to the dictator" and even "Death to Khamene'i," an echo of the regime's perpetual slogans "Death to America" and "Death to Israel," implying a wish not just to correct Khomeini's "sacred system" but an aspiration to terminate the regime dominated by mullahs (Iran's clerics). 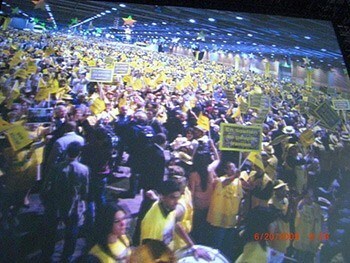 The other protest took place in a vast exhibition hall just north of Paris, where the largest and best organized Iranian opposition group, the Mujahedeen-e Khalq or the People's Mujahedeen of Iran (MeK or PMOI) joined with smaller groups to hold their annual meeting. Tens of thousands attended it, including me. The assembly's most emotional moment came when the anxious crowd learned that their peaceful counterparts marching in Iran had been killed or wounded. At that moment, freedom of assembly in France contrasted most starkly with its denial in Iran. Later that day came confirmation of the regime's obsessive fears of the MeK, when deputy police chief, Ahmad Reza Radan, blamed MeK "thugs" for his own government's violence against the peaceful demonstrators. Bitterly complained that corpses of demonstrators were "wrapped in American flags" and then trampled upon. Condemned the regime's "crimes" in Iraq and its "export of terrorism" to Lebanon, the Palestinian Authority, and Afghanistan. Predicted that "the beginning of the end" of the Islamic Republic of Iran is underway. Rajavi has rightly called for a stronger U.S. policy toward Tehran, explaining in a recent interview that "The West can stop the nuclear program if it stands up to the mullahs." Instead, flux in Iran should invite boldness and innovation. It is time, finally, for a robust U.S. policy that encourages those yelling "Death to Khamene'i" and that takes advantage of the hyperbolic fear the MeK arouses in Iran's ruling circles (first step: end the MeK's preposterous listing as a terrorist organization).